LocoRoco 2 is a special game. I gave it a high grade for its brilliant design, character, and superb gameplay. If you have a PlayStation Portable and you haven’t checked it out yet, I encourage you to do so. Sony have recently pointed out on the official PlayStation blog that a demo is now available for your downloading pleasure. In the same posting, a few LocoRoco-related odds and ends were mentioned. 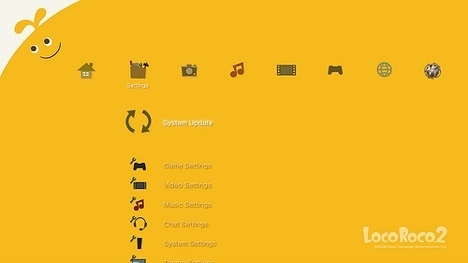 A new theme for your PlayStation 3 and PSP is available for download. It's cute, like everything else LocoRoco. Also, a new Facebook application can be downloaded on the LocoRoco official page. If you’re a Facebook (is there an acronym yet?) zombie, check it out. It’s a little calendar that shows up on your page. It's fun to look at after you finish ruining your professional career by posting drunken photos.